Episode 1 : "Wake Up Walmington"
Episode 2 : "The Making Of Private Pike"
Captain Mainwaring has to be umpire at a local exercise, but there is a car that goes with it. Meanwhile, Pike meets Hodges niece, Sylvia at the local milk bar and tells her he will take her to the cinema at Eastgate. After getting out of going with Sgt. Wilson, Sylvia tries to persuade him to go in Mainwaring's new car. He gives in to her, not wanting to appear as "soppy" as Hodges makes out he is. Pike and Sylvia are like chalk and cheese and she ends up calling him retarded. The car runs out of petrol and Pike ends up pushing it nine miles home. Once home Wilson has a "man to man" chat with Pike. Episode 3 : "Knights Of Madness"
It is announced that the grand march past on Saturday will mark the climax of the "Wings For Victory" week. Mainwaring and Hodges argue about who will do the grand finale, the Home Guard or the Wardens. It cannot be decided, so they agree to share it between them. The event happens to be on St Georges Day, so Mainwaring decides the platoon should do George and the Dragon. The trouble is that the Wardens are doing the same. Who will be the best? Episode 4 : "The Miser's Hoard"
Fraser's funeral business is doing well. Doctor McCeavedy calls on Fraser to tell him Mr Breuster has died, and accidentally knocks over Fraser's stash of gold coins. Concerned for Fraser, the doctor tells Mainwaring about the gold coins, who tries to tactfully raise the matter at that evening's platoon meeting. Fraser realises what is going on and tells Mainwaring that he won't get his hands on the coins, and will put them where no-one will find them. Mainwaring believes the Fraser will bury the coins and the Platoon follow Fraser, whom they see burying a box. Fraser has been too clever for them. They dig it up and find it contains a brick! Episode 5 : "Number Engaged"
A new secret warning device has been installed just outside of Walmington. The information travels along the phone wires, which are guarded by the regular army. Mainwarings's platoon have to guard the 2 mile stretch in their area for 24 hours. The platoon eventually arrive, and Fraser is put in charge of catering, who puts Pike in charge of the porridge. Big mistake! The next day, the Vicar arrives to give an open air service, but is interrupted when a stray bomb is seen in the phone wires. They alert the GPO, but they only send one man who won't go up the pole. After various attempts, they build a tower made of furniture, which they have requisitioned. Pike fails to do any good and it is left to Jones to dislodge the bomb, which falls into Pike's porridge. At least it did come in useful after all. Episode 6 : " Never Too Old"
Jones asks Mainwaring for permission to marry Mrs Fox. The wedding takes place at the church hall, but the Colonel calls and tells Mainwaring to put the platoon on 30 minute standby. 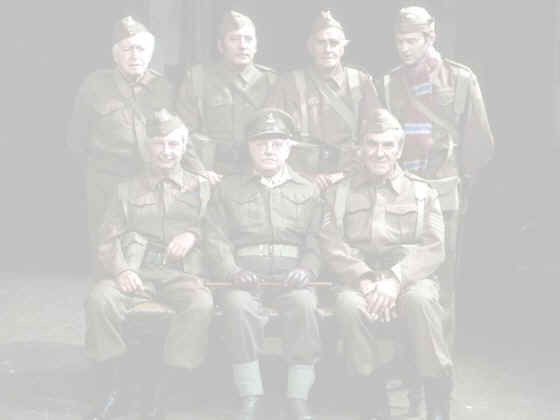 Whilst the cake is being cut, the Colonel rings again, and tells Mainwaring that barges are moving around the North Sea coast and no chances can be taken and that all Home Guard units are put onto immediate standy, which means Jones wedding night is spent on duty with Pike, rather than his beloved. Whilst on patrol on the end of the pier, Mainwaring, Wilson, Fraser and Godfrey arrive with a bottle of champagne to toast Jones. Hodges tries to spoil the occasion by saying they would stand no chance against the Germans, but they ignore him and toast the Home Guard units all over the British Isles.